L'Occitane is an amazing French skincare company, based out of Provence. Dating back to the 70s, the use of natural, high quality ingredients has been the backbone to all L'Occitane products. Extracts from flowers like Lavender, Immortelle, Angelica etc. are incorporated into their legendary soaps, lotions and fragrances which provide incredible benefits and intoxicating fragrances. 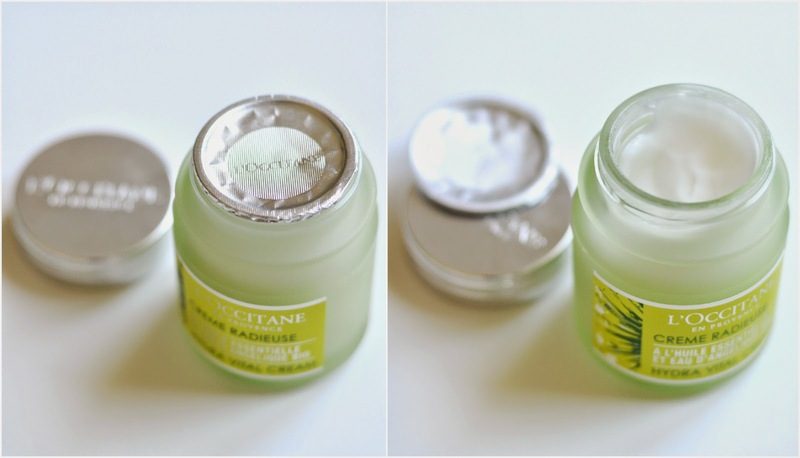 I first featured L'Occitane's best-selling hand cream in my "Bedtime Essentials" post which you can see here. I am always so impressed by companies who not only produce quality goods, but also support worthwhile causes. The beautifully printed box from my cream states "L'Occitane and its Foundation are committed to supporting visually impaired people and encouraging the economic emancipation of women in Burkina Faso. For more information visit www.foundation.loccitane.com". Consequently, all of L'Occitane's packaging has brail incorporated to better serve the visually impaired. A few weeks back, I was approached to try their recently released Angelica Hydra Vital Cream*, which is a new addition to the ever-so-popular line of products for younger skin. The first thing you notice about this particular cream, aside from the exquisite packaging, is its very strong floral fragrance. It's hard not to think that an entire bottle of perfume was stirred into this frosty green pot, since the Angelica flower is so incredibly pungent. That being said, this is mostly a natural fragrance, therefore it won't hang on to your skin throughout the day like a synthetic fragrance would. My only complaint about the packaging is that the glass jar is quite heavy, and isn't suited for travel. An easy solution would be to scoop a bit of product into a smaller travel container and leave the jar at home, since it is such a bright and beautiful addition to any washroom or vanity. The cream itself is non comedogenic, meaning it will smooth on without clogging pores. Here is what the product description says: "The Hydra Vital Cream helps to enhance the skin’s ability of self-hydration throughout the day, helping to revitalize and protect it against external aggressions. This cream provides 48 hours of hydration, making the skin seem more comfortable, radiant and protected against external aggressions." - L'Occitane site. You really only need the smallest bit of product to cover the entire face and neck since it is so lightweight. At $48 per 50 ml jar, I could see it lasting at least one year if used daily. I'm the type that is so sensitive to scents that I can't see myself repurchasing such a strongly fragranced product time after time, since I would easily get tired of it. For a fancy gift, special occasion pamper product, or a daily moisturizer for those enamoured by the Angelica fragrance, I would completely recommend. For the time being, this cream is perfectly fitting for an extra boost of brightness and moisture every few days. Plus, The pretty glass container is a total perk that I'll be sure to reuse. How cute would it be as a bud vase? See L'Occitane's "about" page here for more information on the company and their initiatives.